Clearly, Eric Trump doesn&apos;t follow Justin Timberlake on social media. 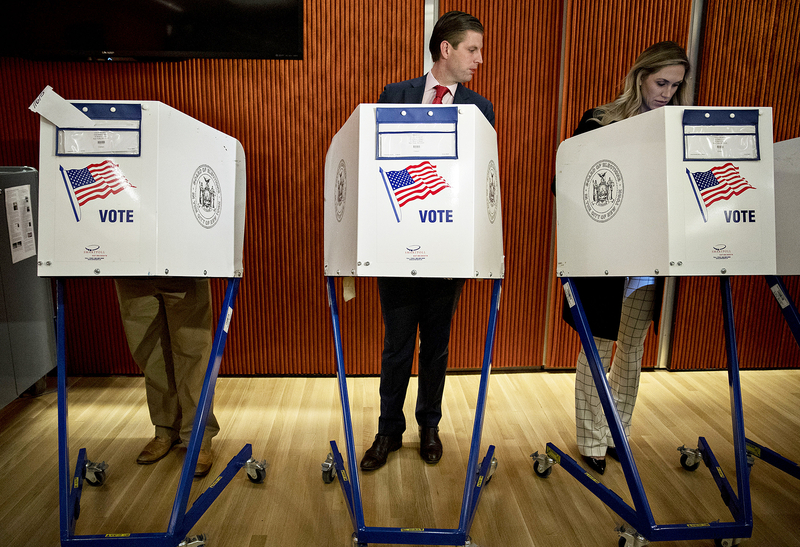 Donald Trump&apos;s son broke a New York state voting law by sharing a photo of his filled-in ballot on Election Day, Tuesday, November 8, two weeks after Timberlake was under fire for doing the same in Tennessee. In a since-deleted tweet captured by multiple outlets, Eric, 32, posted a picture of his ballot as he cast a vote for his dad, the 70-year-old Republican presidential candidate. "It is an incredible honor to vote for my father!" he captioned the Twitter post, according to a screenshot posted by Mashable. "He will do such a great job for the U.S.A! #MakeAmericaGreatAgain." The real estate scion evidently caught wind of his erroneous — and illegal — decision, and immediately deleted the tweet. A federal judge recently declared that New York&apos;s ban on ballot selfies will remain in place, NY1 reported on Friday, November 4. Voters who are caught taking ballot selfies can face a fine of up to $1,000 and a year in jail. "A last-minute, judicially-imposed change in the protocol at 5,300 polling places would be a recipe for delays and a disorderly election, as well-intentioned voters either took the perfectly posed selfie or struggled with their rarely-used smartphone camera," the judge&apos;s decision read, according to NY1. "This would not be in the public interest, a hurdle that all preliminary injunctions must cross." Last month, Timberlake also broke the law when he voted early in his hometown of Memphis, Tennessee. He shared a since-deleted Instagram photo of himself casting his ballot, urging his followers to head to the polls on Election Day. Despite his good intentions, the "Mirrors" singer, 35, immediately made headlines for his illegal selfie. He later joked about the incident on The Tonight Show Starring Jimmy Fallon, saying, "I recently voted. Super quiet, under the radar. Went home to Tennessee and voted. Super quiet, in and out. No one even knew."